A smart Christmas tree controlled by your smartphone using Blynk and ESP8266. This year I decided to modify my old Christmas lights and make it controllable by my smartphone. 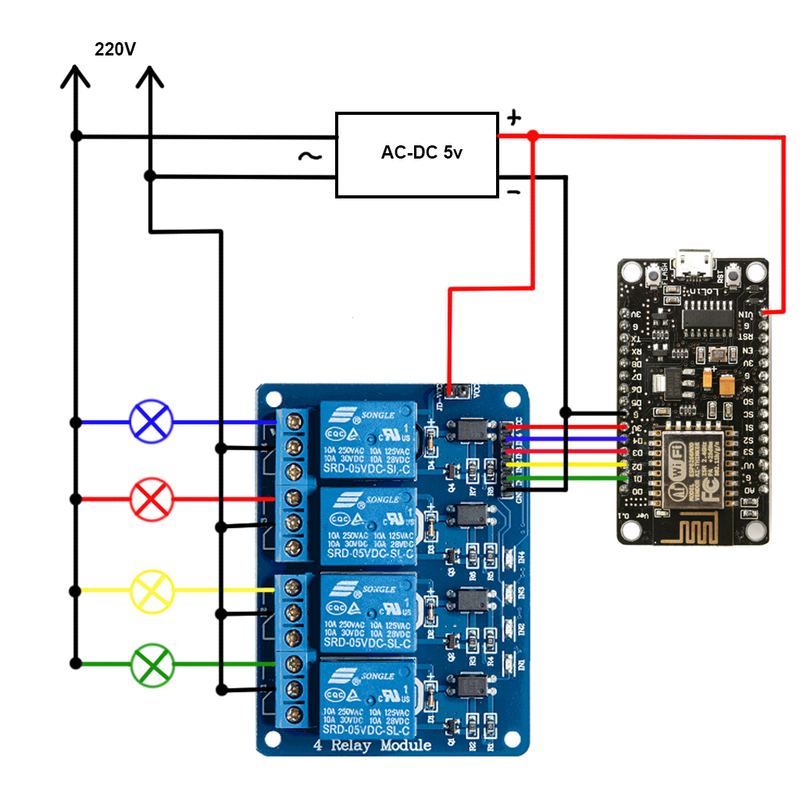 In this project, I use NodeMcu Lolin, 4-channel relay module and DC power supply- 5V. Don't do this project if you do not feel comfortable working with high voltages. My Christmas lights have 5 wires- one of them common and the rest is colors(red, green, yellow, blue). The common wire I connected to one plug pin and the other plug pin I connected to common pins of all relays in the module like it showed in scheme. Color wires I also connected to all relays of relay module. For esp, I used 5V DC power supply which connected to plug. In the Blynk app is placed 9 buttons. First row of buttons is in switch mode and they operate with digital pins of esp(GPIO5, GPIO4, GPIO0, GPIO2). Second row of buttons is in push mode and they operate with virtual pins(V1, V2, V3, V4). If you connected color wires to NO(normally opened) pins of relays you should change buttons output to off-1, on-0. Automatic button is in switch mode and it operates with Virtual pin 5. If you switch it on, lights will flash automatically. This is standard blynk code with some modifications. Virtual pins form 1 to 4 is turn on and off lights. Virtual pin 5 set Christmas lights to automatic mode by changing int variable 'automatic'. In loop we have if statement which launching animation if 'automatic' is 1. Here is demonstration video. Enjoy! This is code for smart Christmas tree project.